Putting a tough year behind them, a year full of accusations of unfair business practices and shortcomings in performance, South Korea’s leading business groups are vowing stringent measures to overcome the challenges that lie ahead in 2019. They say they will make ceaseless efforts to achieve innovation, hopefully on the back of a more favorable regulatory environment. The chiefs of major companies released their New Year’s speeches and corporate messages on the first business day of 2019, messages that show strong determination to pave the way for new growth. The country’s biggest tech conglomerate, Samsung Electronics, which marks its 50th anniversary this year, said it would go on turning out next-generation products and innovative technologies for another five decades. “As we did 10 years ago to overcome the global financial crisis and become the world’s leading IT business, let’s make this year a time for a new leap toward a 100-year business,” Kim Ki-nam, vice chairman and chief executive officer of Samsung’s device solutions division, said in his speech. “We should establish a foundation for sustainable growth in the future by aggressively nurturing new businesses with next-generation products and innovative technologies, while encouraging constructive failures and investing in new technologies,” Kim added. Kim’s remarks come amid increasingly negative forecasts about a slowdown in the global semiconductor industry that will not only impact the overall performance of the tech titan, but also the export-driven Korean economy. SK hynix CEO Lee Seok-hee stressed in his speech the company’s vow to attain 100 trillion won in market capitalization over the next three years. “The importance of memory chips will be greater this year, where SK hynix can play a bigger role,” Lee said. “We’ve started to innovate our research and development processes and raise the yields through our cost-cutting efforts.” Lee also mentioned the importance of its extreme ultraviolet process technology and big data-related technologies. Chung Eui-sun, heir apparent to the country’s No. 1 automaker, Hyundai Motor Group, warned of the market challenges likely to face the company this year and called for innovation in response. “Market rules that are entirely different from the past are being formed, and it’s time for us to seek new growth,” Chung said in his address. Chung also pledged to invest 8 trillion won in the development of fuel cell vehicles by 2030 in a bid to lead the commercialization of the next-generation cars. “We will continue making investments in new sectors that will lead the fourth industrial revolution, while seeking changes in the organization’s work system,” he said. 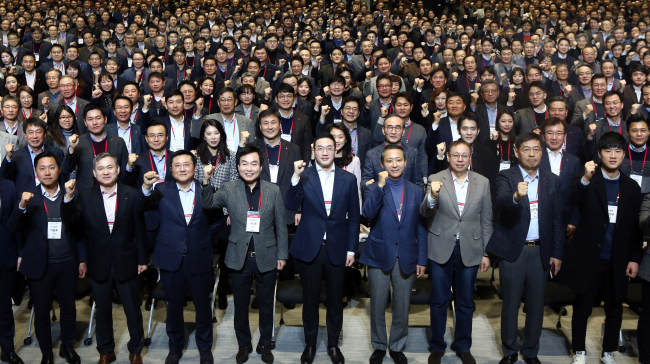 LG Group Chairman and CEO Koo Kwang-mo, the conglomerate’s fourth-generation leader, made his first public appearance for employees at Magok LG Science Park, the group’s R&D hub in northwestern Seoul, where he gave his New Year’s speech. At the New Year’s ceremony, Koo highlighted the importance of customers. “LG’s first value for the customers is to change their lives and impress them,” he said. Meanwhile, the country’s four biggest conglomerates’ top leaders -- Samsung heir and Vice Chairman Lee Jae-yong, SK Group Chairman Chey Tae-won, Hyundai Motor Group Senior Vice Chairman Chung Eui-sun and LG Group Chairman Koo Kwang-mo -- attended a New Year’s ceremony arranged by Cheong Wa Dae and held at the Korea Federation of SMEs in Yeouido, western Seoul. It marked the first time since President Moon Jae-in took office in May 2017 that the four business leaders had met at a domestic event organized by the presidential office. Steelmaker Posco Group Chairman Choi Jeong-woo, in his New Year address, vowed to accelerate the growth of the new lithium-ion battery material business amid the stalled growth forecasts for the global steel market. Hanwha Group Chairman Kim Seung-youn called for the group’s global expansion. Major retailers, for their part, will be focusing on customer experience innovation, digital technology development and overseas expansion in 2019. 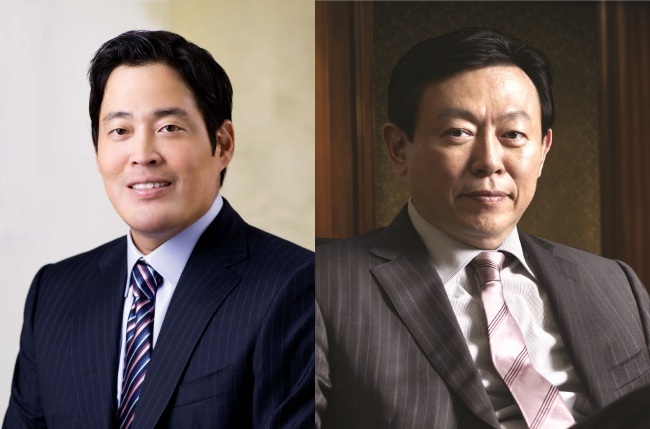 In his New Year’s address, Lotte Group Chairman Shin Dong-bin stressed the significance of “business transformation” for sustainable business growth across the entire group. 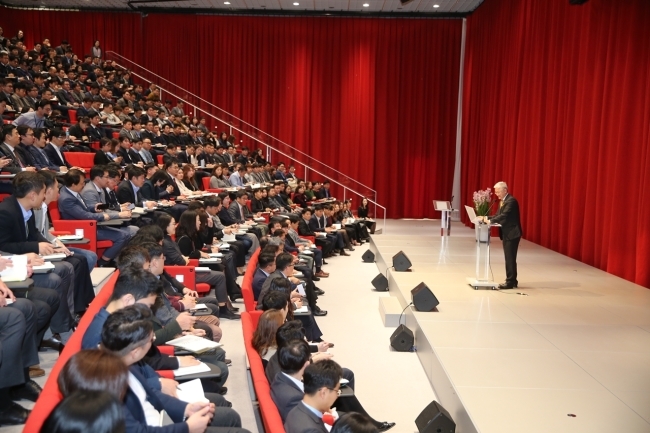 A thorough review and analysis of Lotte’s customer base and business strategy will enable “Lotte to secure the top position in the industry and expand into emerging markets,” Shin said in his address. Shin also said incorporating the latest digital technology will solidify the group’s existing business models. For this year, Lotte has set aside 12 trillion won to intensify the two pillars of the group’s business -- retail and chemicals. The group plans to reinforce its online retail business with artificial intelligence, as well as to expand large-scale chemical production facilities in Korea, Indonesia and the US. 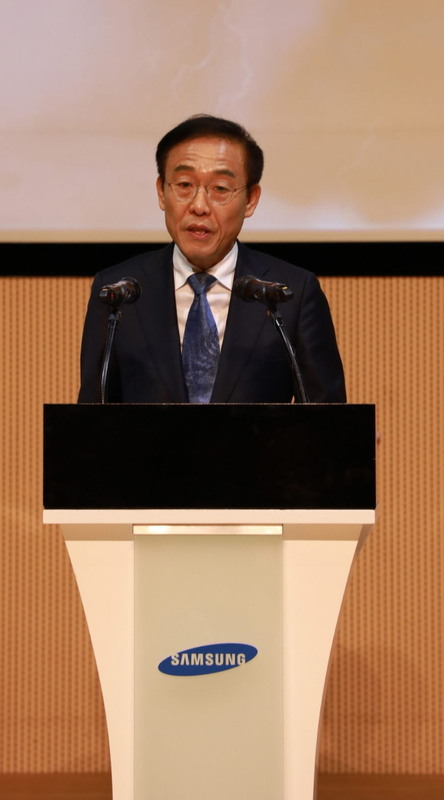 “To preoccupy the market, we must create a smart and low-cost business model on our own to satisfy customers, who are becoming smarter and smarter,” Shinsegae Vice Chairman Chung Yong-jin said in his New Year’s address. Last year, Shinsegae took a step closer to this new kind of “smart shopping experience” by unveiling Korea’s first autonomous shopping cart, Eli. Its discount chain operator, E-mart, also joined hands with LG Electronics to develop technology for a commercialized smart shopping cart that follows customers and does not require pushing. Food-to-entertainment conglomerate CJ Group will be seeking to expand markets overseas in 2019. Identifying companies such as Nestle, DHL and Disney as rivals, Sohn said CJ Group would strive to become the world’s No. 1 company in the food, logistics and entertainment sectors by 2030. Recently, CJ has increasingly made inroads into the US market after exploring markets in China and Vietnam. In November, CJ acquired a majority stake in the Minnesota-based frozen food company Schwan’s. In August, the group acquired a 90 percent stake in US logistics company DSC Logistics for 231 billion won, pursuing its objective to become one of the world’s top five logistics companies. Air carrier Korean Air is looking to achieve wide business reform in the new year. Korean Air President Cho Won-tae said in his New Year’s address that the company would undergo reform in 2019, when Korean Air celebrates its 50th anniversary of establishment. “Korean Air will create flexible workplace culture that employees can be proud of,” said Cho, adding that the company will be focusing on listening to employees’ voices and expressing gratitude to its customers. Beauty companies are seeking to cross the border and put customers first in 2019. Amorepacific Chairman Suh Kyung-bae stressed the ability to embrace change and focus on satisfying customers amid competitive market conditions. “Based on our deep understanding of creating an innovative product, we must enhance customer experience by crossing borders of online and offline platforms as well as into new markets,” said Suh in his address. LG Household and Healthcare is also looking to strengthen customer trust and advance its business structure in the new year. “One must ceaselessly ask oneself if I am making the best-quality and (safest) product. Do not allow yourself to grow complacent and keep an attitude of desperation over the results that have been achieved,” said LG Household and Healthcare Vice Chairman Cha Suk-yong in his New Year’s address. Last year, LG Household and Healthcare’s premium cosmetics brand The History of Whoo reported accumulated sales of 2 trillion won, a milestone for a Korean beauty brand. It has maintained strong growth despite a sharp drop in the number of big-spending Chinese tourists visiting Korea and a slowdown in the Korean consumer market.